In the video below, Lucy is interviewed by KHON News. High up above our residence was a huge boulder weighing close to 10 tons. It posed an imminent threat to our neighborhood. However, with careful planning and maneuvering, it was successfully removed. We are NOW safe! Just as the removal of this huge boulder required careful planning, co-ordinating of ideas, and accuracy to maneuver it to prevent accidents, our performance in Tai Chi requires concentration, precision and timing to make our form smooth and flowing. In both cases, proper alignment is our primary focus. Furthermore, safe and natural positions for balancing are implemented for a successful outcome that prevents injury and falls. NIU VALLEY (HawaiiNewsNow) - Residents in an East Oahu neighborhood have been given the all clear to return home after crews moved a potentially dangerous boulder to a more stable location. According to the Department of Land and Natural Resources, residents were notified at 4:58 p.m. that they could return to their homes on Haleola Street. 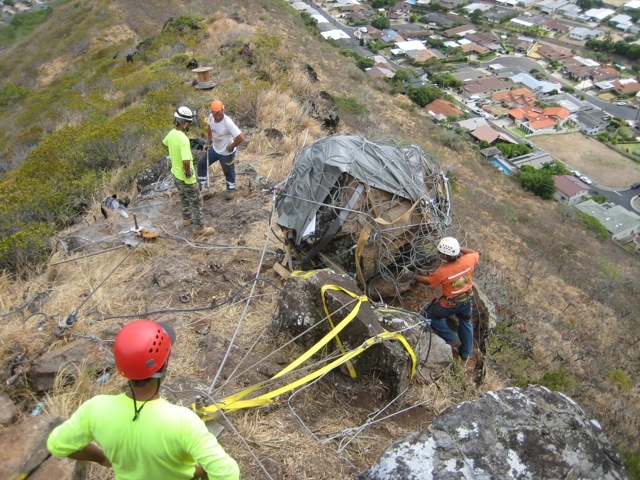 Geotechnical contractors Janod Inc. were able to secure the boulder with heavy-duty straps, tarps and a ring-net mesh sling. Those were then attached to cables and several anchors that had been drilled into bedrock to hold it in place. The rock was then pulled back by an air winch and secured on a flat area nearby. The DLNR said the rock will be broken up into more manageable pieces and bagged for future transport at a later date. The contractors will also return later to secure and break up another nearby rock outcropping, which does not pose an imminent safety risk. The state ordered the mandatory evacuation of 28 homes along Haleola Street beneath the ridge, but three families signed a waiver and chose to stay. A member of one of those families had nothing but praise for the work. "This project is going along very well," Lucille Chun said. "And even though we had to regroup, rethink and plan for the weekend, it's actually turning out very well. So I have nothing but admiration and support." The rock, which measured about six and-half-feet by five feet, was estimated to weigh seven to ten tons. DLNR chair William Aila and state Civil Defense Vice Director Ed Teixeira were among those who watched the work Sunday. Lt. Gov. Brian Schatz also visited Haleola Street to observe the work Sunday morning. NIU VALLEY (HawaiiNewsNow) - A neighborhood in Niu Valley was virtually deserted Saturday and Sunday as work continued to remove a boulder, estimated to weigh seven to ten tons, from a ridge above the homes. A helicopter started flying equipment to the top of the ridge above Haleola Street on Saturday. Crews had mobilized earlier in the morning to start the work, which actually got underway a little late, after a delay involving property where the equipment would be picked up by the chopper. "the owner had the gate locked, so we had a slight delay in getting a hold of the owner," said Ed Teixeira, vice director of Hawaii Civil Defense. "So we about an hour behind schedule, I think." By 10 a.m., the chopper had dropped off the last piece of equipment -- a large air compressor -- to the waiting workers. According to state Civil Defense, the compressor will be used eventually to move the big boulder to a more stable location. "They (the contractors) have a way to just kinda lift that particular rock up with a lot of netting, and the idea is to take this rock and roll it back," Teixeira said. It would then be in a location where it could do a lot less harm, facing the other side of the ridge toward Kupaua Place. "Unlike this slope that you see behind me, the other side of the hill is a more gentle grade going down, and it goes into a ravine, and then the ravine goes out about another 100, 150 yards," Teixeira said. Even though almost nobody was home, there were some signs of normal activity. A postal worker was allowed to deliver mail, and the Saturday trash pickup went on as usual. According to the state, all but two families decided to follow the mandatory evacuation order. "A mandatory evacuation can be enforced," said Teixeira, "but we respect people and their homes. Our attorney general's office even gave us a waiver form that resident can sign if they don't want to leave." By afternoon, workers had placed temporary straps around the big rock to hold it in place, while below, a civil defense worker and police kept an eye on the neighborhood. "Should something get loose, we wanna be right there to pound on that door and do what we can to get that particular resident out," Teixeira said. Even with Saturday's delay, the state is still hoping that the most dangerous work could be done by late Sunday, when residents are scheduled to be allowed to return. "And be safe I think that was the major thing on everyone's mind," said Niu Valley resident Lucille Chun. Lucille Chun is one of the original residents on Haleola Street in Niu Valley. About 5 p.m. on Sunday, Niu Valley residents who had been evacuated received the all clear to go home. An unstable boulder, weighing about seven to ten tons, was removed from the ridge above their homes. Families in 28 homes were evacuated on Friday. "Oh we were very happy. We were overjoyed because this has been a two day project and to have to evacuate from your home is not an easy thing," said Lucille Chun, one of the residents who were evacuated. "Especially in our family we have four generations and my mother is 94-years-old, so last night we actually signed a waiver to come back in to sleep." Earlier on Sunday, crews moved the boulder higher up on the ridge and stabilized it. They’ll come back later this week to break it up and take away the pieces. Chun's garage was used as a command post. The Chun family, whose home's carport was being used as a command post by Texeira, intended to spend the night at a relative's house in Kuliouou. Lucy Chun said that at first it was jarring for the family to learn Wednesday that it would need to join other neighbors in finding other housing arrangements this weekend. Nothing like home sweet home. Dozens of Niu Valley residents will get to sleep in their own beds Sunday night after being evacuated since Saturday morning. It was all because of a huge boulder. The boulder weighs about seven to ten tons and it's at the edge of a very narrow ridge. Down below, dozens of homes. "Last night they secured everything, made sure everything was double singed, because the rock did creek and moan and they felt it move," said Ed Teixeira of the State Civil Defense. This job is described as one of the most difficult ones in years. "So the whole thing was to use the winch to tilt the rock back and airbags to life 'em up, but all they could do was winch it back and back and it rolled. It actually rolled in front of us," Teixeira says. Lucille's home is on the extreme end of the boulder's projected path, so her family was allowed to come back home Saturday night after signing a waiver. And everyone has been using the Chun's garage as a homebase. "We haven't seen each other for awhile so we've been renewing old acquaintances," said Kenneal Chun. It's also where officials have been giving status updates to the evacuated residents. The difficulty in this whole project is making sure the boulder doesn't roll down the hill in either direction. Plans changed a couple times. "This time going to original plan, give one flip over, repositioning bags, and flip boulder towards the Hawaii Kai direction," Teixeira explained to residents. Officials gave the all clear just before 5 p.m., about two hours ahead of schedule. "It's a relief and everything went for the best," Kenneal says. Crews will come back to the area this week to break up the boulder and take away the pieces and also to move a second, smaller boulder. collection of personal pictures and videos you may find enjoyable. See friends, neighbors, VIPs and a special talk on Tai Chi!